What and what not about Chinese Black Vinegar Chicken? The what is, Chinese Black Vinegar Chicken is the confinement food. The Yin and Yang for keeping body warm during confinement. What not about Chinese Black Vinegar Chicken? Can't be regularly for people like me who is always on fire (Chick Kut Teh). In fact, people like me who can sweat for no apparent reason. Of course, once a while will not hurt. Especially when rain is or has massively lashed. My this version to Chinese Black Vinegar Chicken? Somewhat a twist and turn. Most probably? I added dried red chillies and some of ingredients listed below for elevating the taste to a different level. Otherwise? Its just like how Chinese (Chap Chai & Yam Basket) will make Chinese Black Vinegar Chicken. 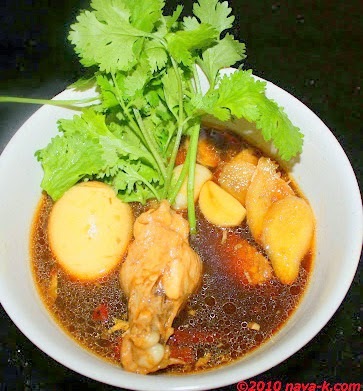 Tang, zang, spiciness, saltiness and tender moist chicken in broth. When oil is heated, fry chicken, garlic, ginger and dried chillies for a couple of minutes. Pour 1/2 litre of water. Season with black vinegar, sugar and salt. Simmer over low heat until chicken is tender and soft. Simmer for another 2 mins after which remove from heat.